Your pet is as much a part of the family as anyone else in the house. Set aside a day or even just an hour or two to give them extra attention with these special rewards to let them know they’re loved. Store-bought rewards are just fine most days, but a baked-from-scratch snack can be especially delicious for your pet. Search online for pet-safe recipes—most rely on just a few pantry basics and many accommodate pet allergies, too. Or check out a local pet supply store for homemade cupcakes and cookies made just for cats and dogs. 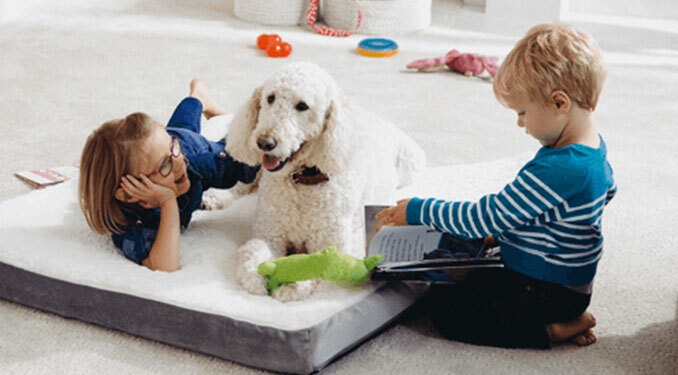 Personalized leashes, new ergonomic dog beds, a winter-ready “coat”: Take your dog to the local pet store and pick out something special that makes life at home (or on all those activities) more enjoyable for both of you. If your cat or dog will tolerate grooming by a stranger, book a time for an indulgent session at a local pet spa or see if your city has mobile pet spas, which bring the brushing and grooming to you! Rather keep it in the family? Plan an at-home bath and brushing session. Kids can help pick out special scented shampoo and spray to use. Other ideas? Pet massage or acupuncture, especially for dogs bothered by joint issues. Many pet-only spots feature fun challenges such as agility ramps and jumps, while others are glorious long stretches for animals who love to expend some off-leash energy (and find new dog friends, too). Check local rules before visiting; many dog parks require a special tag, entrance fee, or permit. Dogs that love to roam will enjoy traipsing on paths and trails for a few hours. Or, check out a local nature park with a pet-accessible body of water. Pack treats and a portable water container for both you and your dog and obey posted leash rules.